Racers attacked again and again in Round Seven, showing no mercy on the punchy hills that left many behind. In a close sprint, Dan Bigham takes Ribble Pro Cycling’s first win! 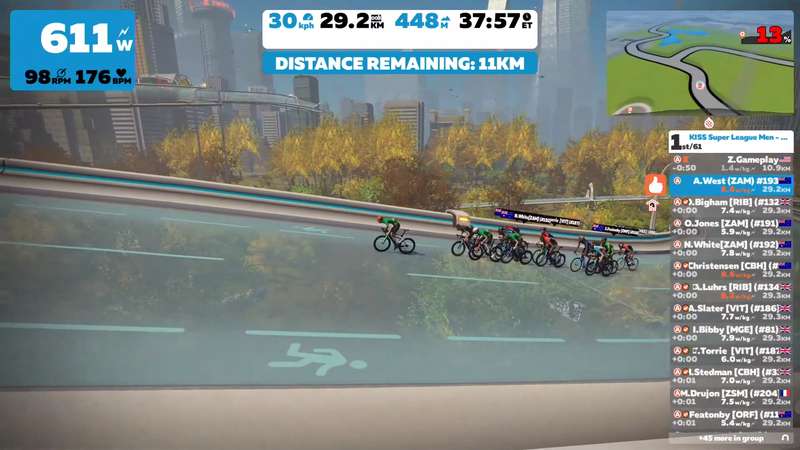 Racers faced two laps of a futuristic New York City route featuring tough, punchy climbs. Each lap is 20 kilometers, for a total of 40 this race. After just 3 kilometers, the racers are greeted by an 800-meter long climb with a 7% average grade. This brings them up to glass roads along the city skyline. A few kilometers of flatter skyway lead into the reverse KOM (King of the Mountain) climb, which is 1.1 km long at an average of 6%. It’s not an even climb – after a shallower section near the middle, the slope goes into the double digits. A 1.4-km descent brings riders onto rolling ground-level roads in Central Park. Finally, the lap finishes on top of the 300-meter-long, 6%-average-grade Cat’s Paw Hill. Several competitors from different teams gathered in the real New York City for the KISS Super League this week. 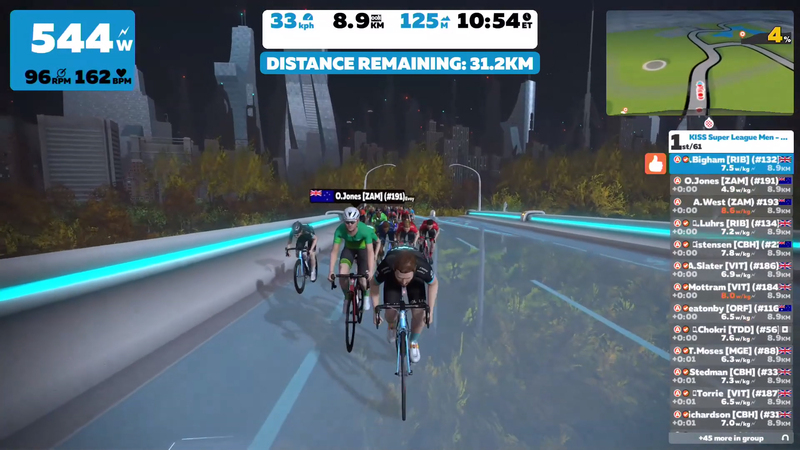 They rode trainers side-by-side in front of a group of cheering spectators, showing the massive physical efforts behind their calm Zwift avatars. The first climb of Mighty Metropolitan can come as a shock just a few minutes into a race. A handful of riders fell behind on the first ascent up to the glass skyway. The peloton calmed a bit in next few kilometers before starting the steep climb up to the KOM banner. When the group hit the hill, the race exploded! 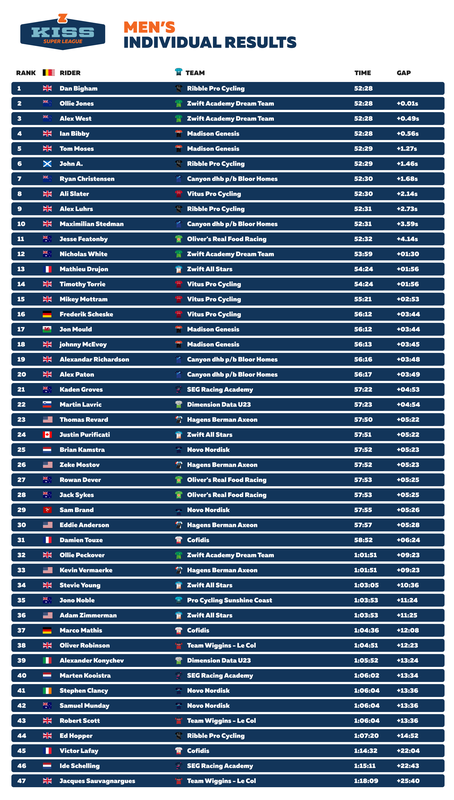 Dan Bigham (Ribble Pro Cycling), Ollie Jones (Zwift Academy Dream Team), and Alex West (Zwift Academy Dream Team) led the way up as the back of the pack shattered into pieces. After the first climb, there were 15 racers left in the lead group. 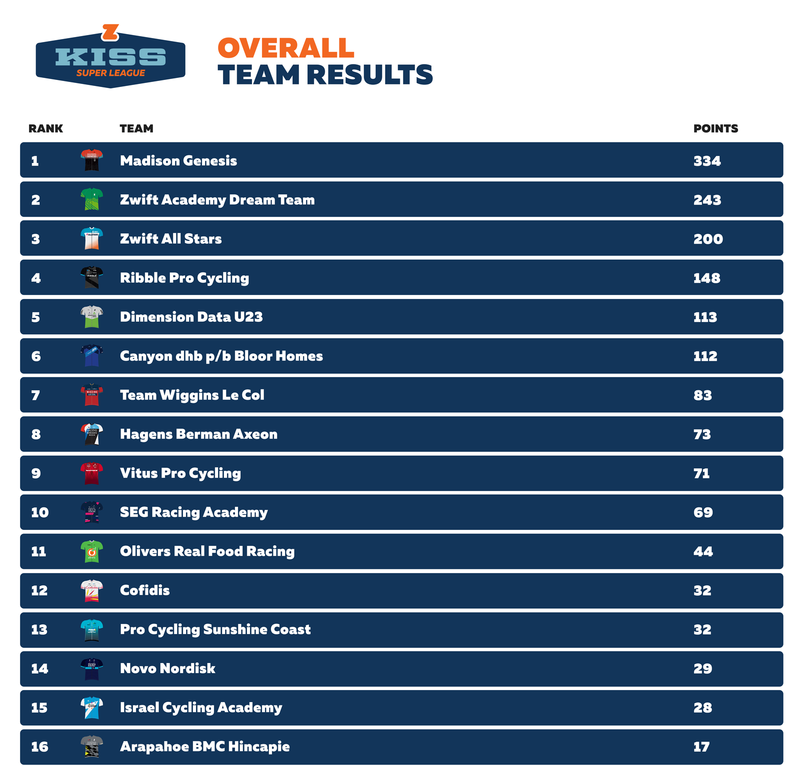 Both Ribble Pro Cycling and the Zwift Academy Dream Team still had three riders involved. El Mehdi Chokri (Dimension Data U23) attacked twice on the rolling terrain after the descent. The second time, he pulled out a gap of 15 seconds! The Zwift Academy Dream Team worked to bring it back down. Soon, Chokri found himself behind the lead group after his daring efforts. The leaders were controlled on the second incline to the skyway. At the base of the reverse KOM climb, West and Bigham again powered to the front. Then, Ian Bibby (Madison Genesis) punched through them with a big attack! Bigham struggled to catch but finally made it, before most of the group clawed its way back. They were down to 11 now. 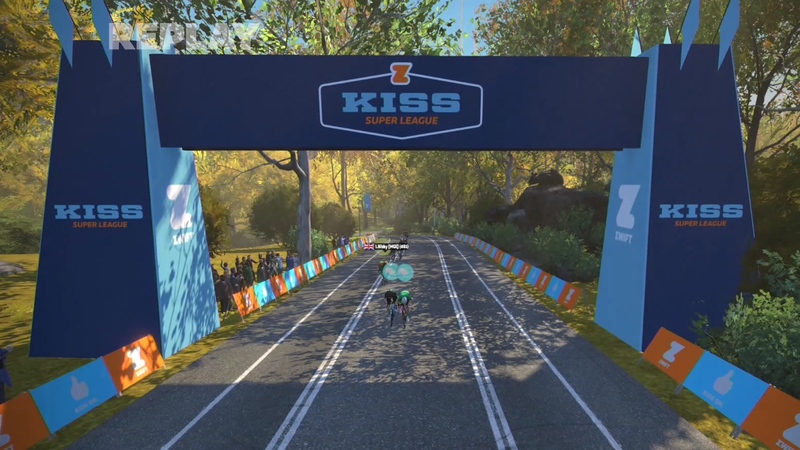 The surge dislodged Nicholas White (Zwift Academy Dream Team) and Timothy Torrie (Vitus Pro Cycling), along with Mathieu Drujon – the last of the Zwift All Stars among the leaders. Then, the hill kicked up again. Bigham saw his chance and attacked, with West close on his heels. Bibby followed to make a breakaway of three. Ryan Christensen (Canyon dhb p/b Bloor Homes) led the chase behind, . and the group stretched out as it crested the top of the hill. The three-man breakaway had a four-second gap at the start of the descent, but it soon came back together. “I had really good feelings for the first lap, but I was feeling a little fatigued into the 2nd KOM climb and asked Alex (West) to try keep it together as much as possible,” said Ollie Jones. The lead-in to the finish was tense. A few riders tested their opponents with short-lived attacks, including Christensen and John Archibald (Ribble Pro Cycling). But the group wouldn’t let anything go. The sprints kicked off with a burst of power from Tom Moses (Madison Genesis). Archibald quickly came around him, and Christensen used a draft truck PowerUp to hang on to his slipstream. Then, Bigham and Jones shot past with a speed boost from aero helmet PowerUps. The two sprinted to the line in a photo finish! Bigham managed to just hold off Jones, claiming victory for Ribble Pro Cycling. The plan for Ribble Pro Cycling was to sit in as much as possible and not try to attack the climbs. Bigham didn’t exactly follow it! He said he was “feeling awesome” so he decided to take them on, recovering as best he could between the hills. 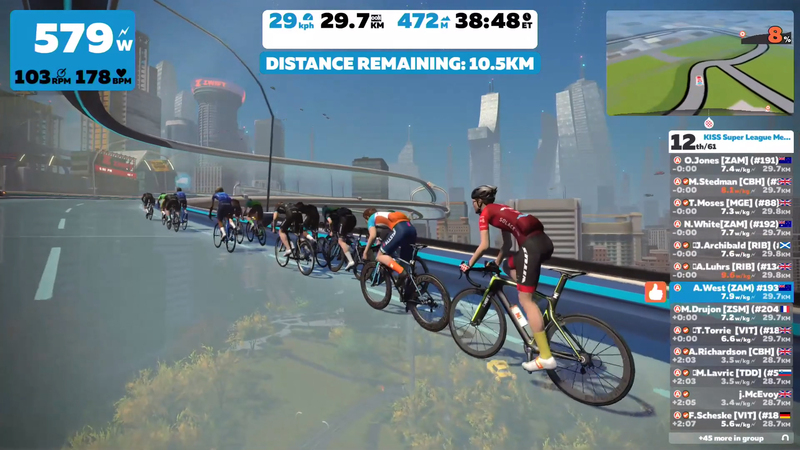 The team has been getting more used to how racing works on Zwift. Some of the riders, like Bigham, have entered other races to help them prepare. This week, they were the only team to place three riders in the top 10. The Zwift Academy Dream team always expects Madison Genesis and Ribble to be aggressive, Jones said. They knew the attacks were coming. “We went into the race with a lot of confidence after last week, so we definitely wanted to push on the climbs and work to our strength,” Jones said. This week, a Zwift update meant that racers could no longer carry a PowerUp into the event. They had to hope that the three banners they would cross would give them good options. At the finish, many riders were left without an aero helmet PowerUp – often the strongest one in a sprint. “Alex only had a (lightweight) feather PowerUp before the finish and I had an aero, so he just committed to helping keep the race together for me in the last 4km,” Jones said. Tune in live next Wednesday to catch all the action!